Sultan Ahmed bin Sulayem, Group Chairman and CEO of DP World, has been elected as Chairman of Virgin Hyperloop One, as the company is ready to start implementing the world’s first hyperloop system. Besides, Jay Walder, one of the world’s leading mass transportation and technology executives, has been appointed as the company’s CEO and a member of Board of Directors. With this new senior management team, Virgin Hyperloop One intends to shift its focus from technology startup to mass transportation company. The pilot project to be realized is the hyperloop system running from Pune to Mumbai in India, where the government has recently declared it as a public infrastructure project with international consortium of DP World and Virgin Hyperloop One as the original project proponent. If the Indian government ultimately awards the consortium with a concession for the project, the company expects to start constructing the 11km test loop in 2019. 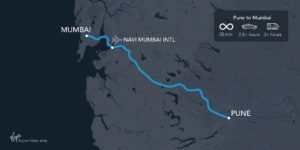 When completed, hyperloop can reduce the travel time between Mumbai and Pune, which are 150 km apart, from about 4 hours to 25 minutes. DP World confirms that it recognizes the value of hyperloop to distribute time sensitive cargo at the speed of flight and the cost of trucking. In the course of a recent round of funding DP World will become Virgin Hyperloop One’s largest investor. Sultan bin Sulayem replaces Sir Richard Branson, who stepped down last month, while Walder will replace Rob Lloyd, who served as CEO for more than three years and leaves after successfully guiding the company through its largest expansion including creating the first and only hyperloop system, a pipeline of projects globally, and raising substantial funding. During this time, the company has grown and positioned itself as the frontrunner in the hyperloop space. Jay Walder has led the biggest and most complex transportation systems in the world, serving as Chairman and CEO of the Metropolitan Transportation Authority in New York, CEO of the MTR Corporation in Hong Kong, and Managing Director at Transport for London.